I went to Melbourne as a 10-year old. Most of my parents’ friends from India, where I was born, seemed to have settled in Melbourne rather than in Sydney where we lived. So, we made a summer family trip to visit. I remember eating lots and lots Indian food, the tremendous summer heat, the trams on the city streets…but little else. So, I was delighted and excited when I was invited to teach backstrap weaving by the Handweavers and Spinners Guild of Victoria. Here was a chance to venture to the southern end of the Australian mainland once again and experience Australia’s second largest city. I was hosted by Ruth Mitchell who lives within walking distance of the guild. The guild is a truly unique place among the various guilds that I have managed to visit in my travels. It is located in North Carlton, a beautiful city suburb of Victorian era cottages and terraces. I do love inner city living and spent some years before I left for South America in Strawberry Hills in inner city Sydney. I loved walking the blocks to ”work” every day at the guild. Every little cottage and terraced house was gorgeous…the lace iron work, the little gardens, the colors!, not to mention the palm tree-lined streets. I couldn’t get enough of it. Of course, I took lots of pictures strolling home in the late evening light and I can’t wait to weave something inspired by all those iron work patterns and colors. The pattern formed by the colors of the brickwork in this house reminds me of the dru, horse’s tooth, pattern used in Bedouin weaving. It will be interesting and challenging to try to create patterns in brocade that capture the beauty of the Victorian era iron work motifs. I must get some fine silk for that so that I can make the patterns as detailed as possible. It will be a nice piece to commemorate my Melbourne visit. As you can imagine, after strolling these streets in the mornings with thoughts of pretty iron work and brocade in my head, I would arrive at the guild feeling very inspired and ready to weave! I did tell you in my last post that the home of the guild is a marvelous place. It’s big! There’s a large library, craft supplies store, exhibit area, woven and knitted goods store, workshop spaces and rental equipment storage space. The craft supplies store certainly did some damage to my wallet. I wanted to bring home Australian fleece for spinning and I also bought some Landscape Dyes…colors of the Australian landscape. Lesley gave me a skein of yarn from Bendigo Woollen Mills to use with the dye I had bought. It’s labeled ”fine merino magnolia” and it feels gorgeous. I will weave something with it on my backstrap loom. I also had a fiber and textile outing in Melbourne with Ruth and I purchased some lovely fabric pieces from Kimono House for perhaps lining some of my woven bags and pouches. Here is the first of the two Melbourne groups busily winding warps for Andean Pebble Weave. My host, Ruth, is second from the left facing the camera. The guild is a busy, welcoming and fun place every day. At least four volunteer staff are there every weekday to run the craft supply store, front desk and library. Marie on the left was my ”go-fer” for the day. I am not used to having one and was hard pressed to keep her busy. I was certainly well looked after! The library now has my books! 🙂 Lesley was on library duty on this day. I picked up some bargain book gems from the boxes of used books. 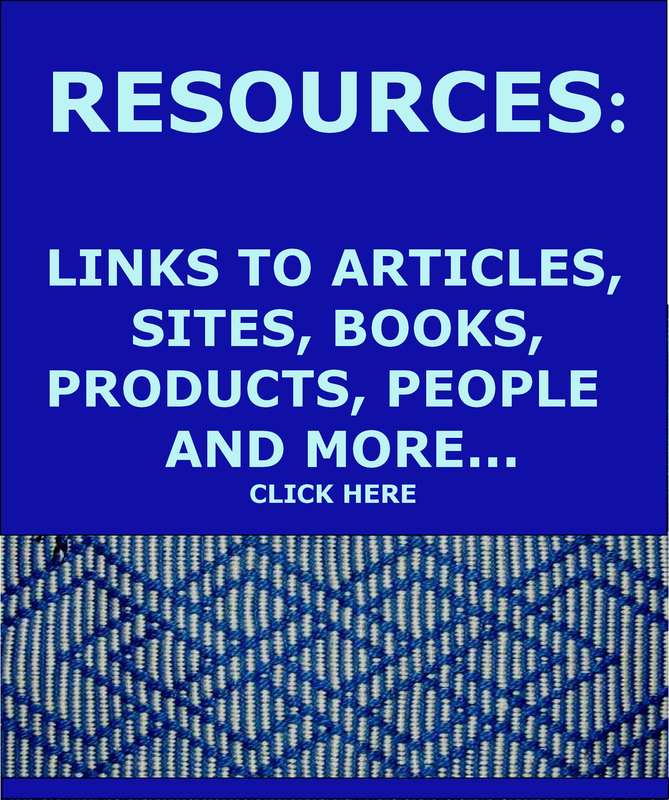 The open magazine has articles on Australian Aboriginal art and Maori textiles. You can see a piece of Aboriginal art work on the open page with a beautiful leaf design…right up my alley! If you are wondering about the weight of my luggage when it was time to come back to Bolivia… well, yes, less important things, like clothes, got left behind in Sydney. Here’s new guild member, Sia, working on her Andean Pebble Weave patterns. Sia walked into the guild and signed up as a member, saw a flyer for my class and jumped on the opportunity. She is hoping to come to the Tinkuy in Peru next year and maybe visit me in Bolivia so perhaps we will meet on this side of the world. June is celebrating the completion of her first star pattern. She was particularly happy when we later learned how to make continuous string heddles mounted on a stick. She had gone to Japan and brought back a traditional Japanese backstrap loom and has been teaching herself to work on it. However, she told me that making the continuous string heddles had defeated her. Here is a picture of her loom. It’s an intriguing set up. I find myself saying over and over ”If I come back to Melbourne, I will….”. That list of activities includes the hope of being able to see June weave on this loom. In any case, even though she has been finding the heddle making challenging, it looks like she has been producing some lovely cloth. She brought along some Japanese textiles to show me as well as her tea ceremony equipment… all wrapped in a furoshiki cloth, of course. You can see one of the beautiful bamboo reeds that she got in Japan. Tatiana, from Chile, was in my second group of Andean Pebble Weavers. She does meticulous handwork and brought me one of dozens of hand knitted dolls she has made. The doll collection is fabulous and I told her that she really should make an exhibit for the guild. When in Chile, she had seen such knitted dolls being made by Aymara ladies from northern Chile and this gave her the idea. She tells me that the Chilean dolls are more rustic and charming. I find the doll she gave me absolutely adorable! 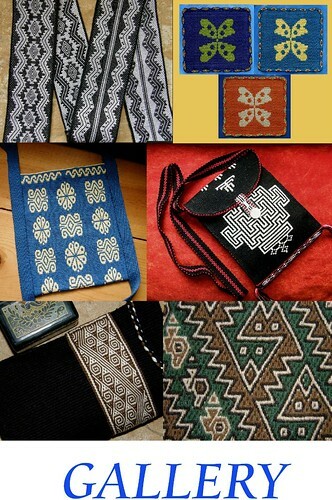 She also had a bag decorated with the embroidery of Ayacucho. I have shown this in other blog posts. My friend Dorothy has some of this Ayacucho work and when I made an appeal on this blog, several people wrote to me to tell me how to do the stitches. I have never actually used the stitches but, you never know, one day…. It seems that wherever I go, I will run into something South American. I showed you in my last blog post the Mapuche belts that Gerlinde gave me. These belts traveled from Chile to Europe to Australia and now are in my home in Bolivia. 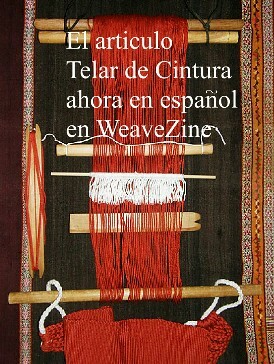 Of course, the beautiful work of the weavers of Chnichero, Peru is internationally known. One of my Melbourne students, Melanie, had been to Cusco where she took weaving classes. The little pouch she uses for her weaving tools is from there. The Chinchero pieces with their gorgeous natural dye colors are instantly recognizable. I worked with two groups in Melbourne. 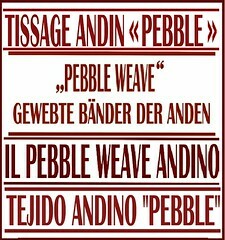 They both learned Andean Pebble Weave. There is talk of forming a study group and I hope that comes together. The guild has the space to hold such meetings but I was told that the problem is finding a spare day as there are so many study groups and other activities happening in the space. While I was there, the kumihimo and tapestry groups got together to braid and weave. On my day off between the two workshops, Ruth kindly took me into the city.. a short tram ride away. We did a little textile and fiber tour stopping first at the famous Australian Tapestry Workshop. It is housed in a historic building in South Melbourne that was once a knitting mill and it is beautiful both inside and out. From the mezzanine level we got to look down on the work area with its works-in-progress and recently completed pieces. Amazing! This piece designed by British artist Keith Tyson is called Gordian Knot The circular piece seems to float in space. Australian designer John Olsen’s piece, Life Burst, was on display in the gallery. Hi signature appears in the corner along with the emblem of the Australian Tapestry Workshop where his design was woven by a team of tapestry weavers. It was amazing to look closely at the piece and see just how many colors had been blended. What appears in the picture above to be solid yellow actually comprises many strands of multiple shades of yellows, oranges and other colors. It was fascinating and mind boggling watching one of the weavers at work. I will always remember Joan Ruane’s remark when she watched me doing pick-up on my backstrap loom. She said something like..”Oh my God, it’s slower than tapestry!” After watching this lady at work…I don’t think so! This piece is called Perspectives on a Flat Surface and was designed by John Wardle Architects. You can see the sample pieces that have been woven and mounted next to the main piece of work. Yep, tapestry weavers have to sample too. It was a very enjoyable visit. There was a hands-on piece in one of the galleries where Ruth and I got to pass a few wefts and leave our mark and then we went yarn shopping. I picked up a half dozen tiny cones of tapestry wool which I think will work wonderfully in warp-faced weaving. There are 362 colors from which to choose and the workshop has a resident dyer. I will weave something to remind me of my visit to the ATW. Melbourne is a pretty city. I found it light, open and airy. It has quite a few churches. This one is St Patrick’s Catholic church. It is possible that Sydney’s CBD has just as many but they just don’t seem to jump out at you like the ones in Melbourne. I loved running into these landmarks. These are names that I have heard all my life growing up in Sydney.We crossed the Yarra river that flows through the city dividing Melbourne into north and south banks. We went to the Nicholas building which houses an eclectic gathering of craftspeople including a tailor from Peru who uses, among other materials. industrially produced fabric from Peru in interesting ways to make elegant coats. After being thoroughly absorbed looking at the various stores and studios we suddenly realized it was 3 o’clock and we hadn’t had lunch. I enjoyed visiting one of Melbourne’s famous laneways. This one, Central Place, is stuffed full of tiny eateries that have just enough space to seat a handful of people. We crouched on tiny stools eating sushi and watched the people go by. There are apparently many of these laneways, each one with its particular personality. At home, Ruth showed me what she has been weaving. I am kicking myself for not having taken photos. She has been using my second book to learn intermesh and has been using her Ashford inklette to weave bands with lettering. She adds the two additional sets of string heddles for the ”mesh sheds” to her inkle loom and was using fine wool to weave a striking red and black band. I was happy to meet Ruth’s two daughters and discover that her elder daughter, Lisa, is a well known Australian singer and songwriter and has been so for the last ten years. Well, I have been away for 23 years and am not caught up with what is happening in Australian music. Lisa Mitchell is her name and here she is performing with one of Ruth’s hand woven guitar straps. 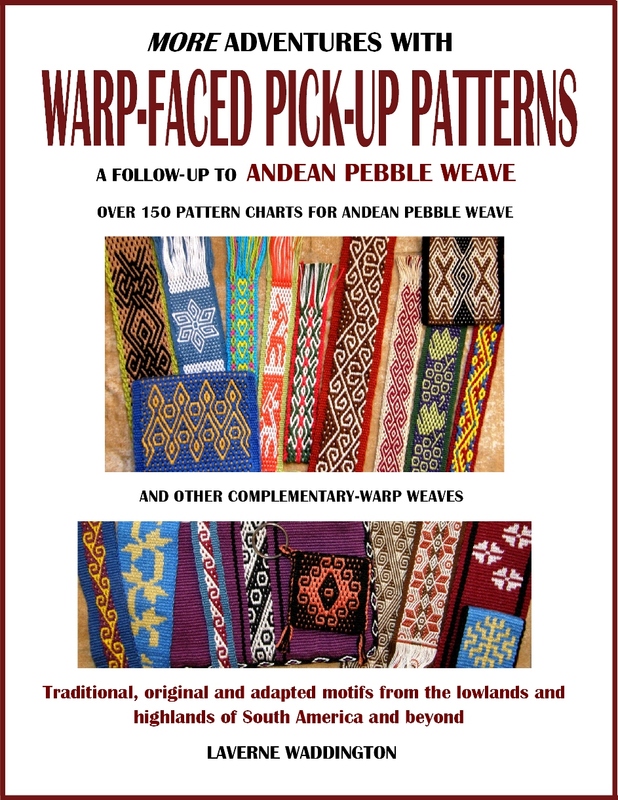 I was tickled to see that she had used some of the celtic knot patterns from my second book that I adapted to the Andean Pebble Weave structure. Ruth has woven several other beautiful guitar straps for Lisa, one of which has silver-colored threads and which catch the light beautifully when Lisa performs on stage. And yes, that’s one of my friend Annie’s guitar strap kits that she is using. I got back to Bolivia last Thursday. It was a 54-hour trip…don’t ask! I don’t think I have ever really known what jet lag is until this trip. Sure, I get tired after a long flight but jet lag is something else again. I have been trying to claw my way out of the fog and get back to my loom and I am pleased to report that yes, it finally happened. I have been putting to use some of the jewelry findings I bought while in the U.S. The cuff isn’t new. Nor is the silk lanyard. You might remember that I wove this lanyard pattern again as I hadn’t been happy with this first attempt. The ”good” one went to the BRAIDS 2016 where I met its new owner. This less-than-good one is now the holder for my new glasses. I forgot my glasses in Sydney, darn it. The new thing in the picture is the bangle. I want to have sets of ”arm jewelry” and wear them all at once from wrist to half way to my elbow…cuffs, bangles, braided wristlets and bands like the lady in the picture below. I have been fascinated by this idea ever since I came across the picture. You may remember it from this blog post. So, here are two pieces in the ”blue” set. There will be more ”arm jewelry” in blue to come. So far, I have a bangle and a wristlet. I will use a tiny braid to connect that wristlet, tied through the eyelet at one end and looped around the button. The wider piece is going to be sewn into a cuff with a tubular edging and then I will weave a few tubular bands to also use as wristlets. I have lots of things going on right now that are preventing me from getting into a large project…although my head is overflowing with great ideas!! The list gets longer. Traveling opens my eyes to so many things and gives me the time and head space to organize my ideas, visualize possible projects and make adjustments and improvements before I can even touch the loom. My small jewelry projects are keeping me happy for the time being. They are fun. I hope I get to wear them soon. Are you still in Melbourne? I would love to attend your classes. No, I am back in Bolivia now, Lidia. Are you a member of the guild in Melbourne? I am making plans for next year and will email you. Oh, so neat to see how you used the jewelry findings! I like that bangle bracelet. Did you use a tubular band? Thanks, Annie. I didn’t weave the bands on the bangles as tubular bands. I just wove flat bands and sewed them around the bangles. It was easy to do. 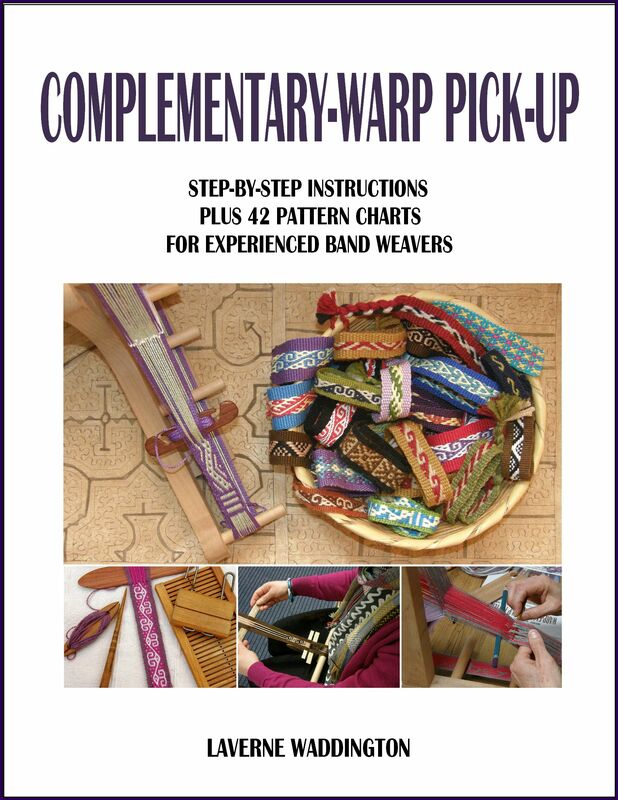 When I weave bands as tubular bands, they spiral and that can sometimes ruin the way the pattern looks. Hi Anna! While you are wishing for and dreaming about South America, I am thinking ”Gosh I would love to see Tassie and visit Anna”. I must make it happen next time! I’m so jealous of Melbourne’s weaving guild. I hope their members appreciate what an amazing resource they have. It makes me want to move there when I retire. See you soon, Berna. BTW Melbourne was recently announced the ”world’s most livable city”. Amazing Keith Tyson wow.The Guild how fortunate for the lucky people who are there even for just a visit. I love dyeing with the Landscape Dyes and I live on the New Jersey coast, the colors model color in all natural settings! Another wonderful pictorial! The guild is stellar and the city is so special. having never been to that part of the world, it was a great tour. Thank you Laverne for this interesting chronicle of your visit to Melbourne and your fresh perspective. I have never seen such a pretty view of the cathedral with the tree in front, which really sets it off. Nor did I know about the tailor in the Nicholas Building, so I shall be paying him a visit. I thoroughly enjoyed your weaving classes and the opportunity to be completely immersed in weaving for a few days. A great treat. Somehow – and I do not know how – I totally missed this post and didn’t even realise you were in Australia recently. I would definitely love to attend one of your workshops, and will happily fly to Melbourne for one. I do not know any other weavers up here in FNQ and certainly not backstrap weavers. I do not know how active the Cairns weaving guild is – I could contact them and find out if they would like to host a workshop next year… please keep in touch via email with your plans and I will help out where I can.